The last Australian horse mounted cavalry charge in history. 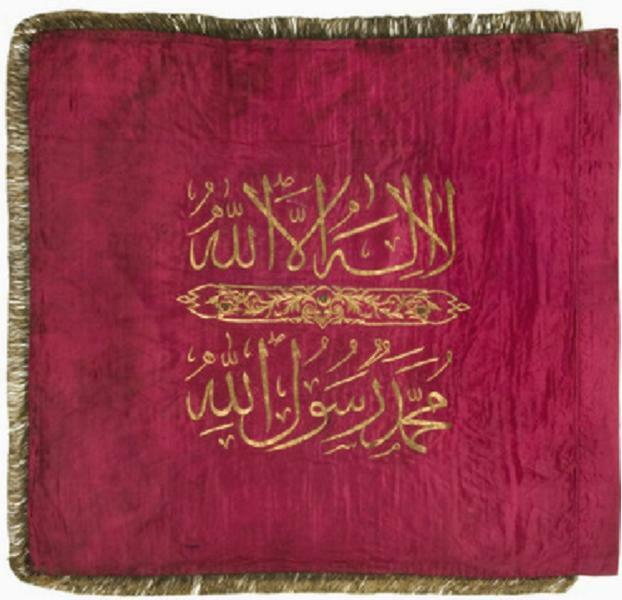 Regimental standard the 46th Turkish Infantry Regiment captured at Khan Kusseir. 0515 Hogan, Lieutenant LR, reported a large column of infantry moving north one mile east of Regimental bivouac. Doubt existed as to whether they were enemy or part of Sherifian Army. A mounted patrol from A Squadron was immediately dispatched to investigate and report and message signalled to Brigade headquarters reporting presence of column about 2000 strong and asking for information. B and C Squadrons were ordered to turn out in light fighting order mounted. 0530 A few shots were heard from direction of column and shortly after a galloper from 8th Light Horse Regiment standing patrol came in hurriedly along the road and reported that the column was enemy infantry. Remainder of Regiment less heavy packs was now ordered out. Reconnoitring patrol had now returned and confirmed 8th Light Horse Regiment galloper's report. Map of the region around Khan Kusseir. 0545 The Regiment less heavy packs moved out to attack. Just after moving following messages received from Brigade Headquarters: - Believed to be Germans and move out at once and investigate 8th Light Horse Regiment and machine guns will be ready for support you if required." With B Squadron in advance and Sharp, Lieutenant RC; and, his troop from A Squadron as right flank guard the Regiment moved at 0545 at a fast trot north east along main road for about half a mile then swung towards the left through the vineyards. The rear of enemy column was now observed about one mile ahead on main road. The Regiment by increasing the pace and moving towards the foothills rapidly gained on the enemy who had by now mounted several machine guns and pushed out several small parties to his left flank to endeavour to hold up our advance. Although the Regiment came under machine gun and rifle fire the enemy failed to check the speed of our advance the Regiment soon reaching a favourable position about one mile from left flank and opposite centre of enemy column. 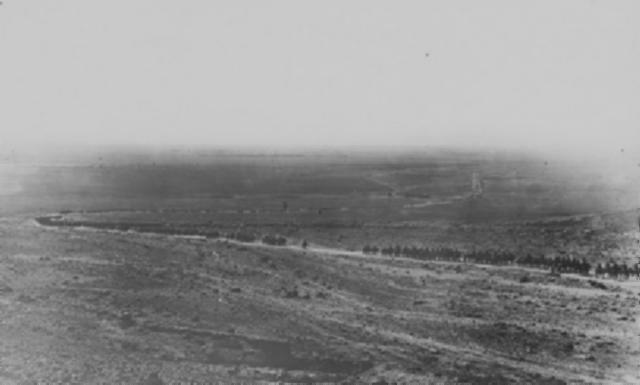 5th Light Horse Brigade marching through the Khan Ayash pass. 0700 Orders were now issued for A Squadron to move rapidly whilst B Squadron took up a position dismounted and brought fire to bear on to centre of enemy column. Regimental Headquarters was established about in Water Channel and touch gained by heliograph with Brigade. 0735 Regimental Headquarters moved to B Squadron position leaving a signal station to maintain touch with Brigade. A and C Squadron were now observed to be ahead of enemy cavalry advanced guard and to be swinging in towards main road to seize Khan Ayash and Khurbet i Asafur thus completely cutting off all chances of enemy retreat. About this time the head of main column of enemy seemed to be in a state of uncertainty and their leaders appeared to be conferring. Simultaneous with the final movement of A and C Squadron remainder of Regiment under orders from Daly, Major TJ mounted, drew swords and charged the main column detaching a small party from B Squadron to gallop around the rear of enemy. The combined movement was entirely successful. The main column surrendered before our troops reached them. A and C Squadron with drawn swords quickly charged the enemy advanced troops composed mostly of cavalry. A Squadron seized the pass and captured two 745mm guns near Khurbet i Asafur. The whole enemy force amounting to 91 officers, 515 cavalry, 1064 infantry, six Germans, 26 machine guns, one mounted gun [No. F7524], two 7.5 cm M15 GKM guns, twelve automatic rifles, 254 rifles, 285 animals was captured within one hour of the Regiment moving from bivouac at Khan Kusseir, approximately seven miles. Amongst the officers captured was the Divisional Commander who defended Shunet Nimrin against our attacks in May 1918. The Regimental Standard of the 46th Regiment was captured. Personnel captured belonged mostly to 45th Regiment. 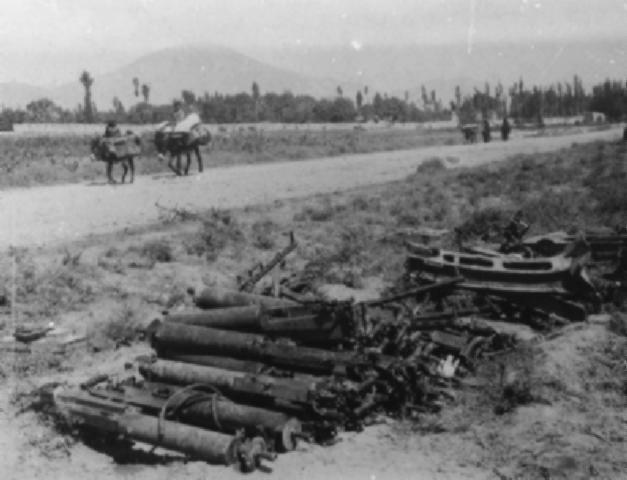 Machine Guns captured after the battle. The rapidity of movement contributed largely to the success of the operation but much credit is due to both Charley, Major WT; and, Bleechmore, Major C, for the skilful manner in which they manoeuvred their Squadrons in so quickly seizing Khan Ayash and the main road entering the pass at Khurbet i Asafur. Also Daly, Major TJ, for ordering charge and Shaw, Lieutenant OJ, for quick issue of orders. 0800 Freebairn, Lieutenant DT, with troop escorted the prisoners to Brigade Headquarters. After the past strenuous fortnight the horses responded to this additional test with wonderful vigour. Ground over which the Regiment advanced was fairly rough and covered with small loose stones. Except for a few small dry wadis the line of advance was devoid of cover. When main column surrendered Smyth, 902 Signaller RN; and, Halliday, 1258 Signaller NC, were moving back to Regimental Headquarters signal station when they encountered a party of the enemy composed of three Germans and 35 Turks taking up a position within a few hundred yards of the signal station. A German officer was mounting an automatic rifle when Smyth and Halliday with great gallantry under bomb fire rushed the German officer taking his pistol and fired into the enemy and seized the automatic rifle. The enemy were so surprised that they surrendered in a body. This promptness of action prevented the enemy obtaining reverse fire on to the portion of the Regiment guarding the main column of prisoners. 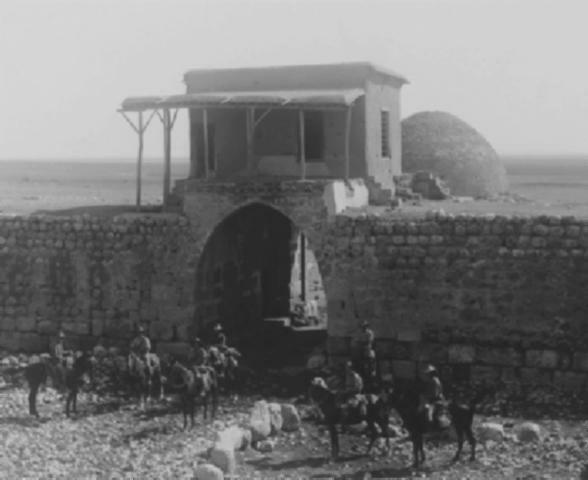 0900 After collecting the captured war material into one dump the Regiment returned to bivouac at Khan Kusseir. 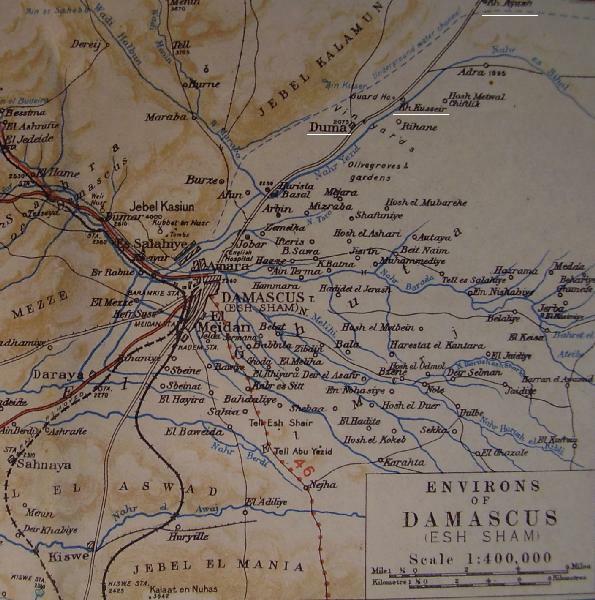 1400 A Squadron moved out to reconnoitre country for stragglers six miles east of bivouac. They returned at 1700 reporting country clear of enemy. Our casualties for the day - one man accidentally injured [crushed by his horse which was shot under him] Animals - one ride killed, four rides wounded. 9th LHR men at the Khan Ayash wall and gate. Extracted from the 9th Light Horse Regiment war Diary.